Futurist Daniel Quinn dares to imagine a new approach to saving the world that involves deconstructing civilization. Quinn asks the radical yet fundamental questions about humanity such as, Why does civilization grow food, lock it up, and then make people earn money to buy it back? Why not progress "beyond civilization" and abandon the hierarchical lifestyles that cause many of our social problems? He challenges the "old mind" thinking that believes problems should be fixed with social programs. "Old minds think: How do we stop these bad things from happening?" Quinn writes. "New minds think: How do we make things the way we want them to be?" Whether he is discussing Amish farming, homelessness, "tribal business," or holy work, Quinn's manifesto is highly digestible. Instead of writing dense, weighty chapters filled with self-important prose, he's assembled a series of brief one-page essays. His language is down to earth, his metaphors easy to grasp. As a result, readers can read about and ponder Beyond Civilization at a blissfully civilized pace. Thank you Irishago for this book! This is a very accessible book for those of us who are caught up in the rat race and are beginning to question where we're going. But it helps to have read at least one of Daniel Quinn's books first. 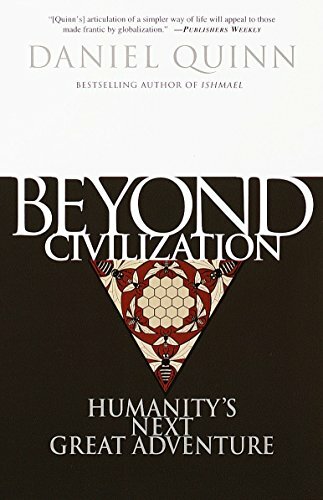 If you make it through ISHMAEL and it leaves you looking for a plan of how to change your personal situation, this book will get you to think about the paradigms that humanity has gone through, and might be the inspiration for YOU to discover. As in his other works, Quinn cites many problems and does not offer any solutions to the reader. The strength of this book (and all of Quinn's work) is that it shatters the memes which the reader takes for granted. Once the reader can think about the problems of our society in a larger context, our range of possibilities grows larger. I do not agree with every statement that Quinn makes in this book (as with almost any book I read), but this book still has enough value to make it a worthwhile investment of my time. It's up for grabs! E-mail me and I'll send it to you, no charge. I received and read this book in one go. Indeed, I read Ishmael first and now am looking further in the background of things. Quinn's ideas and different look at things involve many aspects of our culture and I can see that my view on them has changed already. Bureaucracy, the desire to control, the developments of ever new programs to fight old problems, caused by old structures, and also the hopeful uprising of new viewpoints, everywhere. There are many people I want to share this book with. I will decide tomorrow. Also i have ordered copies of this and other books from Quinn's site, www.ishmael.org. there are many interesting things to find there. Q&A, articles, there appears to be a whole community of groups and individuals ready for change. Go and see! And join, do what you can! I have sent two English copies and one Dutch copy of Ishmael as rings into the bookcrossing world. I have highly recommended it on our forum. Beyond Civilisation is currently being read by one of my friends, an avid non-bookcrosser, who was overwhelmed by Ishmael, too. After he has finished it, I will send out this one as a ring, after Ishmael. Bookcrossing is all about sharing and spreading, ideas and books and whatnot. And building communities. I can see Ron Hornbaker and Daniel Quinn thinking along the same lines. See, things are changing already! Even more amazing then Ishmael. Reading Quinn's work reminds me of getting my first pair of glasses. Suddenly i can see all kind of things i merely sensed before. Old minds at work all over the place (and also some new minds, i'm glad to say). I've been rereading bits&pieces over and over again, but now this book needs to get back on the road. I will give it to Papaver, who has finished Ishmael. Papaver gave it back to me. She promised to journal it, though. I will read it again, be inspired again, and send it on its road.